System Requirements: Compatible with iPhone 4, iPhone 3GS, iPhone 3G, iPod Touch (4th, 3rd, and 2nd Generation), iPad and iPad 2. Slight latency can be annoying. 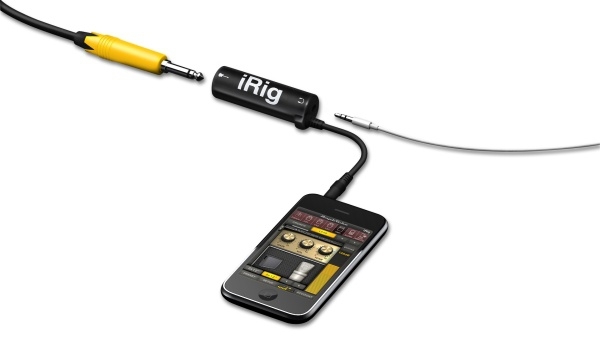 Summary: The iRig is a small, lipstick-sized connector that lets you connect your guitar to your iPhone, iPod Touch, or iPad. 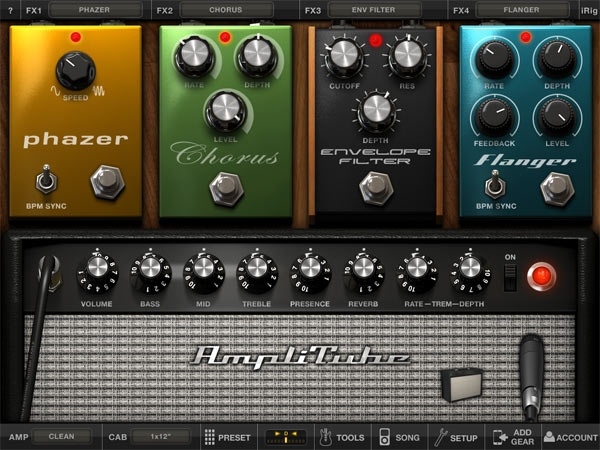 Using the Amplitube software, you can build your dream virtual guitar rig and jam out. Amplitube provides a myriad of useful functionality for guitarists of all skill levels. 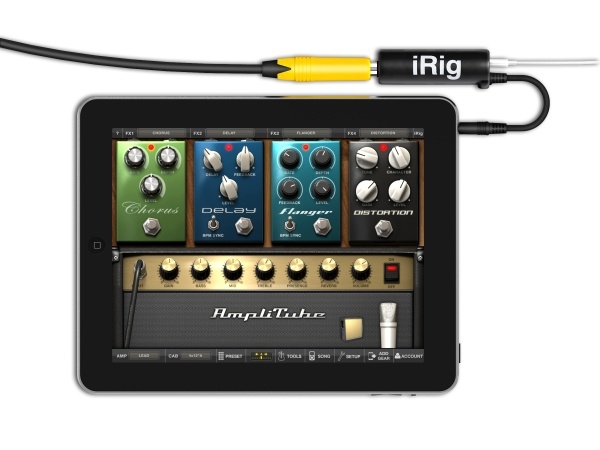 From doing scale drills to learning the toughest licks, iRig and Amplitube make it easy. I am a family man and a struggling guitarist. I love playing guitar and would like nothing more than to spend more time practicing and playing the guitar but my day job and my family come first. Sometimes, I like to sit in the living room with my family and just noodle on my Telecaster to practice. Of course, I can't plug my guitar in or my family would hate me. Last year, I bought a Line-6 Pocket Pod, thinking I could use it to help practice guitar in silence. What I found was that it was difficult to use and some of the guitar sounds it produced sounded terrible. Plus, the Pocket Pod offered no other functionality. The IK Multimedia iRig is the polar opposite of the Pocket Pod. If you already own an IOS device, you can purchase the iRig and the Amplitube software for half the cost of a Pocket Pod. What you then have is a fully functional guitar rig that lets you jam, practice and record in silence (using your headphones). When you are ready to really rock out, connect the iRig to a pair of speakers and crank it up! Figure 1: The iRig is simple to connect. Plug your axe into one end, your earphones into the other, then plug the iRig into your IOS device. Rock on. Once you've got your guitar connected, fire up the Amplitube software your jammage experience begins. I found that using the iRig and Amplitube with my earphones was great. It was very easy to dial in the sound I wanted at the volume I wanted. I did find it somewhat frustrating to run it through my powered studio monitors, however. I connected the iRig to my speaker amp and, even with the volume on my speaker amp turned all the way up and the volume on the iPad turned all the way up, I couldn't get the volume I desired. I tried tweaking the input and output levels in the software and could improve it, but there is a point where the sound begins to feed back. This is an area I'd like to work with some more to see if I can get it loud enough to make it a legitimate practice amp. Figure 2: The Amplitube interface is stunning, and provides a simple way to dial in the tone your're looking for. Amplitube comes loaded up with several amp models from which to choose. Everything from a clean Fender Twin Reverb to a maxed out Marshall stack is available (although brand names aren't used in the software). Once you select an amp, use the virtual amp knobs to dial in your sound. At first, I found the knobs difficult to manipulate. I kept wanting to run my finger in a circle around the knob to twist it, but I then found that it's easier to simply brush up to turn the knob up, brush down to turn it down. Simple. You can also choose a cabinet type - everything from a single 12" speaker to a full stack. Tweak your sound even more by choosing a microphone type (simulating a studio set up). Once you've got your amp tone dialed in, add up to four stomp boxes round out your sound. Choose delay, fuzz, overdrive, wah, chorus, phazer, and more. Each stomp box models a famous version; for example, the overdrive pedal looks and sounds suspiciously like a Tube Screamer. If you like what you hear, store your sound in a preset for easy access later. Amplitube comes loaded up with some factory presets to get you started. Tweak those or start fresh - the choice is yours. That's Cool, but So What? I have to admit: when I first started experimenting with iRig and Amplitube, I wasn't sure how useful it would be. It was fun to play with different sounds, sure, but beyond that, so what? That's where some of Amplitube's other features come into play.